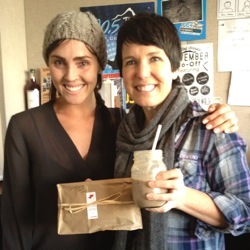 Last week, I stopped by The Peak for a banana bread-related radio interview with the always perky, music-obsessed Tamara Stanners. If she and I didn’t go way back, the mysterious, beige-colored beverage I thrust at her as we greeted may have been received with apprehension. But after revealing it was a ‘To Die For Banana Bread Smoothie’ made by the hands of the brilliant ‘juicetenders’ of The Juice Truck, she gave it a shot. Click here to listen to the interview that ensued and to learn the news I was shocked to discover about the banana bread’s nutritional information. Thanks to Tamara for the fun chat and to the whole gang at 100.5 The Peak!